Rajeswari Sunder Rajan was educated in Bombay and Washington DC. She taught for many years in India before moving to the U.K. where she was most recently Professorial Fellow at Wolfson College and Reader in the English faculty at the University of Oxford. Dr. Sunder Rajan has been a Senior Fellow at the Nehru Memorial Museum and Library and at the Centre for Women’s Development Studies, New Delhi, and she was Shansi Visiting Professor at Oberlin College, Ohio. Dr. Sunder Rajan’s work spans debates about the relationship between gender, postcolonialism and culture in the context of post-Independence Indian nationalism. 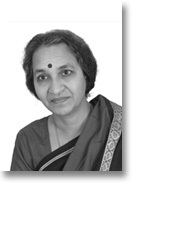 Widely considered to be significant critical interventions, Dr. Sunder Rajan’s writings (Real and Imagined Women, 1993, and Scandal of the State, 2003) have re-defined the terrain of postcolonial feminist studies, and have been widely used in a variety of intellectual contexts. Her co-authored essay, “Shahbano,” which first appeared in Signs (1989), has been widely anthologized, and also titled “The Subject of Sati” (Yale Journal of Criticism, 1990). Additionally, Dr. Sunder Rajan works on British nineteenth-century literature and Anglophone postcolonial literature. An early edited volume, The Lie of the Land (Oxford University Press, 1992), was influential in opening up the field of post-Independence English studies in India to renewed examination. Dr. Sunder Rajan edits a series on Issues in Indian Feminism for the Indian feminist press, Kali for Women, and is a Joint Editor of Interventions, an international journal of postcolonial studies. Her recent work includes a co-edited volume, The Crisis of Secularism in India (Duke University Press, 2006). She is currently completing a book on the post-Rushdie Indian novel in English.